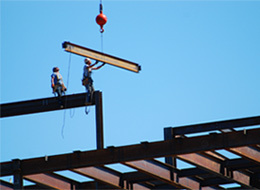 Tri-State Ironworks, Inc. has a full service, experienced steel erection department focused on quality and safety. As of July 2012, the company successfully met the requirements to earn AISC's Advanced Certified Steel Erector qualification. Our field erectors are proud members of Memphis Ironworkers Union Local 167. With a team of field crews, all terrain forklifts, portable welding machines, wire feeders, conventional mobile cranes and an all terrain mobile crane; any job is possible, from raising tilt-up wall panels, trusses and girders to setting any structural steel member. Our field operations are supervised by a team of professionals focused on accurate and safe job completion. As of March 15th, 2002, all field personnel were certified per IAW OSHA SubPart 2 guidelines and regulations. Tri-State Ironworks, Inc. takes pride in quality work, safe working environments, and their fully trained, experienced union ironworkers. Copyright © 2008 TRI-STATE IRONWORKS, INC. All rights reserved.